There’s always an area of any city that becomes the place to see, to be seen and to know about. While we were living in the UK in Manchester, this area was the Northern Quarter. In Istanbul, tucked away in the back streets of Beyoğlu is the old area known as Çukurcuma and, during the last couple of years, it’s been impossible to ignore. Raved about in independent blogs and foreign and national press alike, Çukurcuma was the new black and so, when we were in Istanbul in October of last year, it was placed on our Istanbul itinerary. We love wandering around, getting lost and taking in new places – and we also wanted to see what all the fuss was about. If you read this blog a lot, you’ll be fully aware that the weather gods were not smiling down upon us during this short break, but we’d already written off so much of our itinerary because of the wind and rain, we were determined to not let the weather affect our little expedition through the streets of Beyoğlu. After passing the very tempting Asrı Turşucu (pickle shop) in Cihangir and managing not to make a purchase, we knew we’d hit upon the Çukurcuma area as soon as we saw the wooden wagon wheels displayed outside the shops. Historically, Çukurcuma is known as the area where the skilled wood craftsmen resided and created their wares and many of these goods are for sale in the tiny antique shops that line the steep, narrow streets. On this occasion we didn’t take part in any shopping activities. We were here just to mooch. These days, antique and modern goods made from wood, and bric-a-brac and haberdashery shops selling all manner of goods from yesteryear, share cosy corners with high-end boutiques, art shops, bars and eateries. Suspecting our budget would be blown if we even dared to enter any of these new, little worlds, we contented ourselves with window gazing and wandering. The temptation however, was great. Interesting that we didn’t spot any of the cats of Çukurcuma but then they probably had more sense than us and were curled up somewhere to keep warm. We’d like to return to this area at a more pleasant time of year to see what the atmosphere is like as, aside from us, we didn’t come across many other human beings either. Even the shopkeepers, usually hovering around their doorways, were nowhere to be seen. 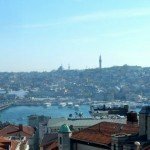 Çukurcuma is well worth exploring if you are in Istanbul. It’s a peaceful haven, despite being so close to the masses of Istiklal Caddesi, and you can easily spend a few hours wandering around the mesmerising displays in the shops – just don’t forget your wallet. To get a feel for the atmosphere and local history of Çukurcuma, take a look at this short video on The Guardian website. Sounds like a must-stop – never been. Love those photos! This looks like a very interesting place to explore. I have not been there yet….but I will go now. I love anything with antiques….I’m surprised dear hubby didin’t show me here. 🙁 Thanks for sharing your travels through Istanbul….love your pics. @ Erica(Irene): It’s quite an international area and is becoming an area for the young things to have their cool apartments. 😉 I tried to look up some info in one of our guidebooks and there was nothing in there either.